Tomorrow is a very special Show Us Your Life Blog post dedicated to all the pregnant girls out there or those waiting for a child who like to plan ahead. (It will be good once you are pregnant or adopt to come back and refer to this Blog Carnival! Wink!) (and I'm going to try by this weekend to get all the recent posts up on the separate site). But this has been on my mind today and I'm impatient so rather than wait for tomorrow's blog carnival - I have a quick question for moms - did you get walkers for your baby??? 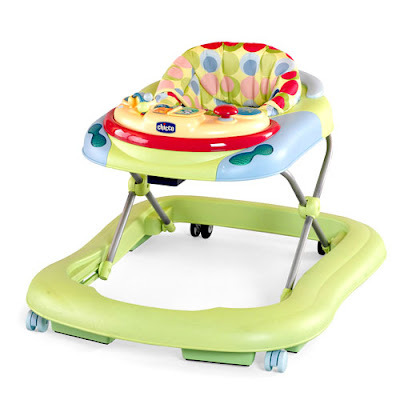 We have an exersaucer which I love with all my heart but I'm wondering if having an actual walker would be good too. I like having several different places I can put Harper to contain her and let her play. We do a lot of floor time in her room but when I need to cook dinner or go to the bathroom (ha!) - it's nice to have somewhere safe to put her. Plus I thought it might help her get moving! Is it worth it? I realize she may be walking in a month or two (or maybe not for 4-5 more months) so it wouldn't be useful for long but what with a baby is? Let me know your thoughts because I may or may not be getting her one this weekend based on your feedback! Thank you: I'm stopping comments for now! I've made up my mind one way so thanks for all of your wonderful suggestions!!! Come back and share your baby suggestions tomorrow!!! We had one and LOVED it! She could travel around room to room following me before she could walk, or even crawl well. It put her upright which she loved. I say absolutely. A lot of people say they're dangerous etc. (maybe so near stairs on a second floor - duh!). Do whatever you think is best for her, you, and your family! Yes we had one with our first (I'm currently pregnant again) and loved it and so did she. We got ours at Wal-Mart. I actually looked at the one that you posted (it matched our high chair) but Wal-Mart had an orange one that was bright and colorful that wasn't nearly as much. I think they still have it, check it out. We recently got a Britax Roundabout convertible carseat and LOVE it! She is much happier in it. As for the walker, I have always heard they aren't very safe, especially if you have surfaces she can walk off of in it and flip over. I would also consider whether you have things in your house that she can run into and knock things over on her with. Either way, you will have to make sure everything is baby proofed really well, and it will take time to find all of her favorite no no spots. I have a small basket of "kitchen toys" that I keep in the kitchen and while I am cooking dinner, before hubby gets home, and she plays there with me and in the dining room that connects to the kitchen. I also save plastic containers to sour cream etc for that basket b/c she loves playing with them and it saves my tupperware! Once mine was really crawling, and pulling up on everything, she didn't want anything to do with the exercauser anymore. I am lucky if I can get her to go in the jumperoo, she would prefer to be independent and explore. I would invest in some baby gates and special toys for your kitchen area. yes get a walker it was a life saver! My son loved it! I would recomend that you just buy a cheap one. you are right they are only in them for a little while. so the cheap one from walmart or babies are R us just fine. Mine was 25.00 dollars and worth every penny! I did not have one because my daughter's pediatrician recommended against it. She said that walkers can delay children's ability to walk because they do not develop the necessary balance skills. I did have 2 exersaucers, one of which went around the center console in circles, and my daughter loved that. She also loved her jumparoo which we hung from a door frame. We had one with our first and it was good. However, I did not get one for either of the boys because they were so happy in their Exersaucer and it was just one more piece of big, bulky baby equipment. Also, I heard a few horror stories of babies bumping into furniture or cabinets and stuff falling on them. So, I bowed out. If you have the room and really feel like you want it, do it sista! I have two sons who are now grown and gone. I had a walker for sone #1 -- he liked it. I on the other hand was not so sure. I had to really watch him so that he didn't get somewhere where he might fall or tip it over. Son #2 didn't like it at all -- he was much happier to be on the floor or sitting in the saucer to watch. I thought they got rid of those - due to safety recalls and what not. If not I guess they are OK. I never used one with my son and I do not plan on it with my daughter. Blaine walked right around 1 year... so I wouldn't say he was behind or anything. If you are getting it so you can help your daughter learn to walk... I would go with a push toy instead. We just bought our 8.5 month old little girl a stroller and she loves it. She pulls herself up on it and just stands there so proud. She hasn't started pushing it yet... but I'm sure that will come with time. Now if you need something to contain your daughter in while doing things around the house... I would just use your exersaucer or buy a baby play yard for her. I'm personally against walkers and I haven't seen anyone use one in at least 5 or more years. All of my friends with kid's just bought a pushing toy and called it a day. Well the was my two cents... but do what you are comfortable with. No one knows your daughter better then you. Here’s the link to the stroller we got her… it’s really sturdy and will last her many years. I am so glad that you asked this, because we are starting to get to that point with our 6 month old twins. They are not quite crawling yet, but are pretty mobile on their bellies (scooting). They LOVE their exercausers but I like the idea of giving them more mobility. Our house is not 2 story, so I really do not worry about the safety...just my walls. ;0) I will check back on the comments you recieve and see what feedback you get. Harper is just adorable and growing so quickly! Loved the walker! My girls loved the walker too. We do not have stairs in our house, so I didn't worry about them falling. Also, the legs lock too, and they usually fold up so you can take them places. My vote is yes to the walker! yes as soon as she is pulling up and crawling she will not want to be in the excersaucer! she will want to move, so i would get one! i am so glad you are asking the moms about this!!! i have had this very same question. my baby boy is 8 months and i have been debating a walker. can't wait to hear what all the moms are saying! we just purchased a britax roundabout...i don't like it at ALL. it reclines rear facing, which is why i got it, but once you put it in the car, because of the slant of the seat the recline position doesn't do anything. hunter has a hard time sleeping in it because he is sitting straight up - it almost pushes him forward a bit. Our son hated it and our house was mostly carpeted so it didn't roll well unless it was on a tile or wood floor. We ended up donating ours, because he would NOT have anything to do with it after the first few times. I guess it just depends on the kid and your floor material. Also, we ONLY use the Radian car seat by sunshine kids. It's the only one that has been crash tested because they don't test car seats, although they should!It's very well made and you can choose one that goes up to 65 pounds or 85 pounds. We have a 2 month old and a 2 year old and it is all we will ever use and we LOVE it! Other ones we tried were cheap and this one is just so much better! Safety is very important to us, so check out it's stats before you buy! If you have the space and want it I say get a nice one on sale. My boys had the Jeep Wrangler that we purchased for less than $40 on sale at Target. Of course that was many moons ago and Oldest enjoyed it much better than Littliest. If she enjoys the exersaucer she will enjoy the walker. Yes, yes, yes!!! Especially if you have open room in your kitchen or living room. I put Cash in his when I am in the shower, and he is able to "walk" all around the bathroom. So much better than him crawling and getting into everything. I bought it when my first born (now 5) was his age. It is just a cheapy from Walmart. But, so great!! It also takes up a lot less room than the exercaucer, so it makes for easier travel. It's a lot cheaper, too! As for the car seat, we have an Eddie Bauer and a Graco. Both from Target. Walmart had some, but they weren't very cute. :) Most of my friends go with the Britax, but we just couldn't spend that much money. I used a walker with my first child; we both loved it! It had a tray on it so I mostly used it when I was cooking dinner. He would have a snack while "walking" around or play with little toys and I could cook! I wasn't planning on buying one and the one I did have, someone gave me that was like 10 years old, but it served it's purpose. Car seats - we have the Britax Boulevard; it has side wings for side impact protection; the best car seat ever! A bit more expensive but many places online have them on sale sometimes and with free shipping! Kelly I couldn't have lived without our walker/walkers. We bought Brooks a "Around We Go" which is an activity table that has a moving seat that he could walk around the whole table. It's got a place for snacks. Even now that my little man is walking, he still walks up to it to eat snacks and play the piano. The seat is detachable so you can just use it as a table later on. It saved my life because I was pumping vs. nursing so I had to put him in something while I was "Milking" ha! We got ours at Walmart.com and they shipped it for $0.97. We absolutely couldn't have made it without it. I have 3 children and used walkers with the first 2. We had wall to wall carpet and neither of my older kids were able to get the walker to move on the carpet. So the walker ended up serving the same purpose as an exersaucer for us. My youngest is 5 1/2 months old and at this point we are not planning on buying a walker because we have an exersaucer and I'm afraid he will not be able to move it on the carpet just as my older two were not able to. My friend said her kids used a walker and moved on the carpet just fine so maybe it all depends on the strength of the child or maybe it depends on how plush the carpet is? Now if I had the walker in the kitchen, on the tile, they moved around just fine and loved the mobility! I would totally get a walker this time around if I had more tile. A walker or a push toy is a must and the ONLY car seat to get is a Britax! They are ultra safe, super comfy and the straps CAN NOT get twisted!!! Good luck on your upcomming purchases!!! We are buying my daughter the Graco My Ride 65 Car Seat. I heard great reviews on it and it's a lot more reasonable than the Britax Brand. The seller point for us is the fact that it can be rear-facing up to 40lbs. With all the new laws/advice about keeping kid's rear facing for a long as possible - 40lbs is a nice weight limit. My first son loved the walker. I've been debating about bringing it for our second son, because my pediatrician advised against it. She said that it could delay walking and cause potential back problems. But, like I said, my first son was in it all the time and he was walking by 13 months. And he also has no back problems whatsoever. Once my children could sit up on their own, that is when I started having them play in their pack-n-play...it's original, intended use! I put toys in there and had it in my kitchen so they could see me and play. Often times I would turn kid music on (like the Fisher Price CDs) and they would be content for a long time...I even had 2 in there at one time (my boys are 11 months apart). It was a life saver for making dinner, laundry and especially sweeping the house! I bought the Cosco Alpha Omega Elite convertible car seat because it could hold children 5lbs to 100 lbs and felt I could get more bang for my buck. I had children in them as small as 3mos. and my 5 year old son is still in his. I have many friends and family with this car seat and all have been happy with it. I have even seen them at Sam's Club in the past for an even better price. Hope this info helps! Good luck with your decision. We LOVE our Britax Marathon!! We got it just before my little Anna turned 1 and she just moved to a booster last week...she is now 4!! It was so worth every pretty penny that I paid for it. I'm keeping it with hopes that she will want to go back in it!! I have 3 girls and never had a walker...mine loved their "Johnny Jumper" things so we never had go the walker route. Harper is just precious and growing up so fast!! We did not use a walker because our pediatrician advised us not to. He said that they can hinder a baby's development and can, in extreme cases, cause some hip problems for kids that don't bear enough weight on their legs and put stress on their hips. I don't know, everyone says something different but that is why we decided not to get one. We haven't used a walker and don't plan to (my son is 11 months old). My mom is an occupational therapist, and my best friend's dad is a pediatrician, and they both say that the best thing for babies' muscle development is truly to be on the floor moving about, learning to pull up, etc. We love our Exersaucer, but I do try to limit the time I put my son in a "container" as my mom calls them. As for the convertible carseat, I'm another vote for the Britax Marathon. They have the best safety ratings, and I always joke that I want one for myself. We have not used a walker either because of advice against it due to it delaying walking and safety concerns. LOVE our Britax Roundabout and right now you can find some good deals on them if you buy a pattern they are closing out. Happy shopping! I think every wise parent knows his/her child and knows what is best for them, but I guess I err on the side of caution in these kinds of decisions. We love it and so does our little girl. It's a little expensive BUT it lasts a long time so it's worth it. Plus well it's cute! We LOVE the walker! My husband and I were just talking about our "best" baby purchases, and we have gotten every penny out of the walker. My daughter is 10 months old, and has been using hers since she was almost 4 months. I don't agree that they necessarily delay walking - she walked at 9 months. She is still content in it while I am cooking dinner or moving laundry and it's much easier to keep her "contained" without her realizing it! I agree with what others have said though - watch out for stairs or steps and any tall shelves or top heavy furniture. Meredith is FAST in hers and runs into furniture with hers a lot, and I have had to take down anything that could be knocked off and land on her. It's amazing to see how well she can maneuver tight spots now though! We have the one in the picture, and you can remove the toys on the tray and I'll give her some cheerios to keep her busy longer. She loves being able to explore the house, chase the dogs, etc. and I feel safer with her in that than just loose. My pedi is adamently against walkers so we did not get one and did not miss it all. My daughter started walking at 10 months. As for the carseat. We LOVE our Britax Marathon. Daughter loves it will ride/sleep peacefully every time. It is also so easy to install, I can literally uninstall and reinstall in less than a minute, which is a blessing if you are riding with a friend or need to vaccum out the car. Good luck with whatever you choose! I am honestly surprised at how many people use walkers. I was advised by so many not to have them at all. We didn't invest in an exersaucer either. We saved those for church. HA! My ped told me that walkers caused the babies to use different muscles than true walking so they actually delayed walking development. Aaaah, the big walker debate. Yes, they can be very dangerous and are blamed for delaying gross motor skills like walking. I personally did not use one. My boys were never very content contained in something like that once they could crawl. I think that with close supervision and avoidance of overuse, they could be o.k., but don't really think they're worth it. Just my two cents. On the convertible car seat - We used the Evenflo Triumph (which got very good safety reviews in Consumer Reports when we initially bought it) until about 2 years old then the Graco Nautilus, which converts to a high back and backless booster. And I think the price of both of these combined is about as much as a Britax seat. I did not use one with Pumpkin. When she was that small there were lots of reports of the dangers of walkers so we never used one. Pumpkin was able to navigate up and down a step into the kitchen while crawling. She walked at 10 months 3 weeks. Seems like everything moved very quickly for her- crawling at 6 months and walking at 10m3w. We did NOT get a walker because they are really not recommending them nowadays as they are said to actually delay a child's learning to walk on their own. They've also been called unsafe. We debated too at the same point you're at & it did take Rylie until 17 mos to walk on her own, but it also took that long for a friend of our's baby who did have a walker, so they're not guaranteed to get them walking faster at all. I would ask your pediatrician if you have doubts! Carseat-definitely dont skimp on this because she'll be in the next one until she's about 3 yrs old! We got a cheap one at walmart last year & the padding's already flat on it & very uncomfortable so we got a new britax boulevard & she LOVES it so much she never fusses to get in & sometimes doesnt want to get out of it! We aren't doing a walker with my daughter. Granted she is almost 11 months old but I have read up on them and the pediatrician advised against them due to them not really helping in teaching a child to stand and walk correctly since they are pretty much sitting and pushing themselves around with their feet. I know they are also dangerous to be by stairs but most parents (I wouldnt think?) would let their baby in a walker by the top of the stairs. As far as car seats, we are starting to look too, and at a great boutique in Little Rock I came across the Sunshine Kids Radian 80 and think we may do that one. The guy there is like a stroller/car seat genius and said they are by far the safest and his favorite and he recommends them way over the Britax. They are also about $100 cheaper than Britax and go up to 80 pounds. We LOVED our walker. Addie did not walk for a while (and it was not b.c of the walker) so I got her one so that she could get around and she LOVED it! I asked my ped about all the advice people give to not get one and he said there will ALWAYS be something you read to tell you not to do something! Just be careful and pay attention to the child! I like the one you have posted but you can get great ones alot cheaper and they all do the same thing!! I have the convertible Eddie Bauer car seat and LOVE it. Addie is 29 lbs and 3 and a half and she will last in that thing forever!! Just a thought on the push toy idea - they scare me for babies who are not strong walkers or who are just pulling up. I have seen the push toy roll out from under the baby too many times, and the baby land hard on their face. I think they are best for interactive play between mommy and baby, but not for baby to approach and play with alone. Just a thought for if you were looking for something that Harper could be occupied with while your hands are busy. I think having her in the walker in the same room as you would be safer. Two words - Britax Marathon. My daughter is 6 weeks younger than yours and we already moved her to it. It's better than the roundabout b/c it goes until they're a bigger size, and it's SO easy to install. Albee Baby usually has great prices if you get a pattern that is discountinued. You can buy cute covers for them on etsy, but just know that the warranty is voided on the seat if you use a cover from elsewhere. It's also plush and has curved in sides for them to rest their heads. LOVE it!! As for the walker, I put Cassidy in my sisters a few weeks ago when we went to visit and she had NO idea what to do after only have jumping toys at our house. 5 days and she never figured out how to walk in it and would end up going backwards and get frustrated and cry! arg! Anyway, I think they're fine if you're watching her - but with her close to outgrowing it already, if it takes her a while to learn how to do it, it may not be worth it. GL! LOVE the walker. My daughter loved it and it gave us lots of entertainment to watch her. I believe like with anything to just use it in moderation. If you just put her in it for short periods at a time it isn't going to damage the hips and such. And if you keep it away from stairs she isn't going to fall down them and hurt herself. My daughter started using hers around 9 months and was walking at 13 months. No hindering her walking!! So, to sum it up, get one, they are GREAT!! I would not get one. I have read that they are not good for babies hip development and that it doesn't help them develop strength in the same way as those that learn to walk w/o one. I would recommend getting her a push walker toy instead. Both my kids had walkers and they both started walking at 11 months. They loved their walkers and so did I. I know Harper will enjoy one if you decide to get her one. Oh yeah! That will be a GREAT post because I am clueless about so many things and need advice! We did not get a walker for either child, our pediatrician suggested we not get one, it can delay walking. My kids both loved the "johnny jumper" or whatever they are called, they hang in doorways and the child can jump up and down, it was a big hit in our house! We didn't get a walker because of the safety warnings, like others have said. But I could definitely see the benefit in having another "restraining device". :-) My son was happy with an exersaucer and jumperoo. We never had a walker, because I always heard they weren't safe. We did have an exersaucer that got a lot of use. But, once my two got to the walking stage, I found we were past the bulky baby gear and on to just drawers and tubs of kid toys that they got into. As for convertible car seat, we have two Britax Marathons and love, love, love them. My three-year-old is still in his and quite confortable as he'll be in it until at least age 4 or longer. They are comfy and safe! i don't comment much but i thought i would today...i would get Miss Harper a walker...my son's pediatrician suggested we not use one but my son did anyway..and he LOVED it, let me tell you! he zoomed around the house in that thing and had a ball..we gave that one away but i will defiantly get another for #2. just make sure (i know you know this) that she isn't near stairs or anything. my son started walking at 9 and a half months! and i'm pretty sure this helped. good luck! harper is a beautiful girl! Jolly jumpers are great for the doorways. My kids loved them!! As a Pedi Nurse I won't ever suggest a walker. They are SO dangerous and kids fall down stairs all the time. If you don't have stairs I say go fo it! As far as carseats go I can't suggest a Britax enough! I have 3 of them and love them. I think the best one to get is to get the one up to the biggest weight allowance. That way she can stay in it for a very long time. My first grader is still in a britax marathon. No way, did not have one for my son. I haven't read all of the comments, but it looks like I could be in the minority here. I've always heard/read negative things about them (dangerous around stairs, delays walking, etc), but I'm a "by-the-book" kind of Mom & I've only had one so far. I have a daughter who seems a lot like Harper (she is now 14 months old.) She LOVED LOVED LOVED her walker, and so did I. I don't know how I would have gotten anything done without it. We started using it around 6 months-right when her feet could reach the floor, and she loved the freedom. I know some people think they are a safety hazard, but I still don't quite understand that (as long as you use common sense.) My daughter wasn't a huge fan of crawling, and started to walk at about 11 months. She now puts her baby dolls in it and pushes them around. SO cute! I wasn't sure about a walker either but we found a great deal on one and got it! Our daughter loves it! We live in an apartment, so there are no stairs for her to go down, so that is one worry curbed. We never got an exersaucer but I would imagine if Harper likes hers, then a walker would be good too! Amelia can't move in hers just yet, but there is a tray to put some toys on and she is content in there, playing. BRITAX!!! they are a heavy expense but they are so worth it! all of our kids have one 2 marathon and one youth and we love them...and they have lasted from my first born to our newest addition... as for a walker..not much help there. we never have had one...grandma does though and our little grae loves it. I did not use walkers for my two kids and they both started walking early (9 months and 13 months). My pediatrician said it would develop the wrong muscles in their legs. My friend's baby broke her collarbone while in one. My cousin is an infant therapist and won't allow her patients to use them. I just think you're better off without it. With my kids, I would put a blanket on the floor with lots of toys and let them play. My sister-in-law used a play-yard to keep hers in one spot. As far as car seats go, I will never buy anything but Britax. My husband was in a car accident last year (our 2007 Honda Pilot was broadsided and rolled) - the car was totaled and neither of my kids had a scratch on them. The car seats (and car, for that matter) worked exactly how they were supposed to. If you google Britax (Marathon, Roundabout, etc..) - you will find them on sale somewhere. Walkers: The pediatricians will tell you not to get them because of safety reasons. Most of what you will hear is about falling down stairs...if you don't have stairs, then what's the problem??? I have also heard that they aren't good to assist in walking....to each their own...we didn't get one with our first baby and won't get one this time around either...Rachel walked at 2 weeks shy of a year and I AM NOT IN A HURRY AT ALL for the 2nd one to walk!!! I am okay with her waiting until she is a year!! =) We have an exersaucer which is what the pedi recommends and we also have a Rainforest Jumperoo that she LOVES!!! WE LOVE BRITAX convertible car seats!!!! They are expensive but worth it. With the 2nd, we actually bought one of the new Graco Nautilus ones...for a couple of reasons. My kids are big. This Nautilus is a 3-in-1. It goes all the way up to a booster seat. What you have to be careful about is getting one that can be rear-facing. The Britax ones can but the Nautilus cannot...can't use it until Lauren is a year. We are going to let Rachel use that one and give Lauren the Britax....sorry so long...hopefully this helps! Hello, I don't have any kids but am currently expecting our first child in February. Through my research in preparing for our first child and reading about walkers, I will not be buying a walker for our child. None of my friends have used them for their children either because of the risk of delaying mobility and hip, back problems. They've all used the exersaucer and most of their kids have been walking by one year if not sooner. Pediatricians are against sooo many things that we use on a daily basis. They see the extremes of everything.We had a walker, loved it, never had any problems and it did not delay our daughters ability to walk! They are dangerous if you sit your child in it and neglect them. For me, after my daughter was walking, we still sat her in it on a high setting to limit where she could go while we did things such as cleaning:-) Best of luck on your decision! I have 3 kids in Britax. One has the Marathon, one is in the Monarch, and the other in the Regent. My oldest is almost 7 and this is the only brand of carseat we have ever had. Well worth the money. Walkers are are recommended. As a pediatric OT, I did not/would not use one with my baby. They are not good for their hips and studies show that babies who use them actually walk later, not sooner. Even the evercaucer should only be used minimally. Stinks, huh!!! Babies love them and they are great for getting dinner cooked, etc!!!! I used a walker with both of my children but only in our kitchen and I was there to supervise them carefully. I guess it is a personal decision just like everything else. I meant they are NOT recommended! Sorry! I've heard that walkers aren't very safe. I also need advise on car seats. DD is almost too long for her infant carrier seat, so we are probably going to be getting a convertible seat in the near future too! Britax marathon for sure! Love ours and won't have to keep buying more. Walkers...yes. Both of my kids loved it. The safety warnings crack me up. It's common sense. Don't put them at the top of stairs. One baby walked at 14 months and one at 9 months. They are going to walk when they want to no matter what you decide. This is all personal opinion and every baby is different. If you have once upon a child I would go there and get one or borrow one from a friend for a few days and see how it goes. We have the Jeep Wrangler one and it has been great. No- never had one because I read they were not recommended. My kids have all learned by cruising and by pushing a little car with a raised back- they could push and then ride. Maybe spend the money on a couple of good baby gates. No. Finding places to "stick" her are only going to make her further behind on crawling and walking. For bathroom breaks and cooking dinner, fine. But the bulk of her playtime needs to be on the floor. My daughter is almost 9 months, and we put all stationary entertainers away months ago, as soon as she started crawling. We keep her safe and "contained" with baby gates. Never had one either as I had heard they were not recommended due to not being safe and how they could easily fall over. My son would cruise around every where and we liked the bumbo seat a lot. We also used a push toy that he could push around the area I was in. I think it all depends on your child. My son had one and NEVER used it. Well he would play in it, but never actually used it for its purpose. We have one and ava loves it... she is content for a while. way more than her other stuff. she feels like she can move around. the only problem we have is when i am in the kitchen we have a low oven and she likes to try and touch it. It doesn't get very hot but it still makes me nervous. but other than that it is great for cooking. ava is eight month old and has started walking and i am pretty sure its because she got the concept down from the walker. My kids LOVED their walkers. They only get to use them for a couple of months, though. We didn't have a walker. I tried to get one but here in Canada they are banned because of the number of children who have died while in one. We have a super safety proofed house so I'm sure it would have been fine, but I have to say that the stats made me kind of glad they're not available. We got an Eddie Bauer/Cosco convertible from Target several years ago. It's worked fine for us. I've heard the Britax are wonderful. There is a site out there somewhere that will tell you which car seats fit well in which brand/model of car. You could probably get some good feedback there. YES all three of mine loved it! I was just careful to keep is obviously away from steps, and to keep a watchful eye on her. Most of them are cheap too, so you don't have to worry about spending a lot. We did not get a walker for our little boy as no one I knew bought one and our drs., etc said that they were not safe. Our little boy was walking by 1 year, so the window is pretty short. Harper is a doll! Love your blog! My daughter loved it! LOVED it! However her pediatrician did not for two reasons; one safety, two she blamed the walker for my daughter's delayed walking. She didn't walk til she was almost 16 months old and the doctor said it was because she was training the wrong muscles for walking when she was sitting and walking. For this reason I threw it out and did not use it with my son. But man, she LOVED it. We did not get walkers (we have twin 15 month old boys) because we had heard not so great things about them. But, they did get these awesome little car toys that they could push around once they learned how to stand. This link has a video of them using it so you can get a better idea of what I'm talking about. :) They loved using this for over a month before they actually started walking. My son is 7 months old and we don't plan on getting one... I don't thinK! Owen's Physical Therapist said that it's not good to put them in for long periods of time and it won't help with walking. I think it'd be fun, especially if she's not in there ALL day long, of course she won't be. We're trying to get Owen a specialized walker through our insurance since he's 20 months and still not walking (darn heart failure). Anyway.. if insurance denies him.. our PT said we'll buy a baby walker and modify it so that he has to stand in it and not sit. I'd say GO for it! I think it'd be fun! You know what else looks like great fun? Those little jumpers that you put in the doorway. We never had a doorway to put it in cause our ceilings and door entries were way too high. But they look fun!! I know this doesn't really help, but GOOD LUCK! Kelly, walkers are not recommended by the Academy or any Physical Therpapist, medical professional, etc. My mom had one of these at her house and neither of my kids really enjoyed it. The danger thing doesn't bother me but it's not really great for developing hips in young kids, so we never really used it much. Those walkers that the kids push around are much better. I would recommend a jolly jumper - my kids loved those! Loved, Loved, Loved our walker!! I bought London's for her when she was 7 months and she was taking steps at 10.5 months and walking every where this past month (11months). So, we only got about 4 months of use out of it (because she wont have anything to do with it now), but it really helped her learn how to move her little feet in the walking motion. If you do get one, DON'T get the Disney Princess one at Walmart. It was such garbage and the seat fell WHILE London was in it the day after we bought it. Thank God she was not hurt and I took it back and got a refund. After the fact I read reviews on it (dumb on my part) and most everyone said it was garbage. We ended up with a cute little green Jeep brand walker and loved it. We got it at Babies R Us. We never bought a walker for our daughter, but I actually liked the aspect of her not being really mobile for the sake I worried my house wasn't baby proofed enough yet. On top of that, when she was at that age we still lived in a very tiny house so our baby gadgets were at a minimum. I'm not opposed to them though and from the comments it looks like many mommies swear by them. As far as carseats go...I'm a tried and true Britax car seat fan. They are super safe, comfortable and long lasting. My daughter has three (one for each car + grandparents) of the Britax Boulevards and she absolutely loves them. We tried to buy her an Eddie Bauer seat but ended up selling it because she was never comfortable in it. The Britax sits nice and high and reclines. The buckles are easy to adjust and it's very simple to install and know it's in good and tight. You might go check out www.babycheapskate.com and read her carseat reviews by actual moms. It's a VERY good resources for all things babies related! I'm pregnant with number 3, and I had one for my two boys (they are 12 and 13 now!). They loved the fact that they could get around quickly! I will definitely be buying another one for this baby!! I had a walker instead of an exersaucer b/c of space reasons. Ours had wheel locks and folded down to fit under his crib out of the way when not in use. He was walking at 10 months so it was nice to be able to put him somewhere when I needed to get something done in the kitchen. He never really used it as a walker b/c I kept the wheels locked. i would cautiously consider the walker. i don't think they are very safe and the baby gets moving so fast that you're constantly worried about where they're at or going. and actually it doesn't aid in the baby walking any sooner, b/c the motion that is required doesn't use the same muscles in the legs as walking. doctors usually discourage the use of them (at least at the hospital i work at) i would recommend a jumperoo! those are the best...lots of entertainment for baby and for mommy :) i would say no to the walker. i never had one and my kids learned to walk just fine, at 9 months, 10 months, and 13 months! I used a walker and walked at 9 months. My 3 year old walked at 11 months and she used a walker as well. I think the delay factor is if you are relying on the walker to teach your child to walk. It can have some safety issues, but use common sense and you will be fine. I found the walker to be most helpful during those few months of transition when she was just barely walking and would no longer settle for crawling but wasn't steady enough for me to just let her wander the house. I actually know more kids that got hurt with those push toys for walking- they go so fast if they are not on carpet and those kids just fell face first and I saw several busted lips and noses in the past few years. I don't particularly recommend those, but my daughter was always fine- you just have to know your kid. The Britax is the only carseat I will ever buy. We have the Roundabout. It was worth every single penny. I have 2 children and never used a walker. I heard they are unsafe and delay walking. I had an exersaucer and they both LOVED it!! Get one... you and Harper will love it! She will keep herself entertained as well as learn to walk! kelly, my kids are grown and gone (egads that makes me almost vomit every time i write or say that!!) and we did have a walker, but if i had to do it all over i wouldn't get one. i agree with the advice to invest in gates etc if you want to keep her in the kitchen with you. good time to have a little fun snacky time in the high chair with you in the kitchen while you cook. . .
probably more info than you wanted, but i wouldn't go with the extra expense! I was asking myself the same questions several months ago. I was worried about safety, if it would slow her actually walking, etc. Well, I got one and it was a really great decision for us. Becasue our munchkin is such a busy body -- I always kept the walker in the van, so when we went visiting I could pull it out and she wouldn't be exposed to all the hazards in an un-babyproofed home. I could also feed her in it. She still got into things at home, but 1) I could always hear her and 2) it took her longer so I had more time to get to her. It's nice too when you bring it outdoors while they're learning to walk and falling a lot. Gives them a little freedom, but without scrapes from the concrete. It's nice to have when yours grows out of it too - for company's little ones who come to visit. Our pediatrician recommended that we NOT get our daughter one. He said it could delay walking and it can also be back for their hips. He recommended getting something for her to push/walk behind. It forces to be more aware of what she is doing and it will help develop her walking skills more. Britax is DEFINITELY the way to go. We had a roundabout but only because the marathon wasn't even out yet!! For my twins, I researched like a mad women, consulted friends, doctors and other moms, and most recommended not getting a walker. For many reasons, most are listed above. But, I bought an exersaucer that converted into a pusher (your not placed inside it, but you can hold onto it and push it to walk) and my girls LOVED it when they were trying to figure out what walking is all about. We also got them toys like a riding toy (they can sit on and ride around the house), an inside lawn mower or popper, toys that help the "walking" concept, but allowing them to see how their feet are moving. Because my girls were born so early (at 23 weeks), and have a condition called osteopenia, we bought the Britax Convertible Car Seats. And I am SO thankful we did. They sure are expensive (especially two of them) but very good, and highly recommended. I cannot believe she is interested in walking...when did she get so big. Our ped and my chiropractor both strongly recommended that we not use a walker with our daughter. Apparently it's not good for their development (acc to ped) and not good for their spine, etc (acc to chiropractor). But that's just my two cents. DD was crawling out of her exersaucer by 7 months (yes she's a monkey!) but she still loves to play with it. She just stands up next to it and plays with all the gadgets. Now that she's cruising and crawling it's harder to keep her contained. I've found that she likes to be in her high chair while I'm in the kitchen as long as I give her some finger foods. Otherwise we just let her go and take her with us from room to room!! She'll be fine without 'em...people have learned to walk for centuries without walkers! No walker here...all we needed and LOVED was a jump-a-roo! I know they don't "walk" in it, but they are able to put their feet directly on the floor and all 3 of my kiddos loved it! Like others have said, I've heard walkers aren't safe and in fact, I honestly didn't even think they made them anymore. Best wishes! Your daughter is adorable!!! We didn't get a walker partly due to space constraints and partly due to safety precautions. An item you might want to consider in a couple of months is something that Harper and push and walk behind. My son loved it for months (he was a late walker) and my daughter, who is Harper's age, will probably be ready for it in a couple of months. We have a Britax Boulevard, because with two kids on either side of the car, we really wanted the Side Impact Protection. The seat is easy to install, comfortable for the kids, and very safe! We LOVE the Evenflo Triumph convertible car seat. It has knobs on the sides for adjusting the straps, which makes it so easy to loosen them if needed (like if they're wearing a jacket) and tighten them back up afterwards. we had one but didnt use it for long because it was actually delaying my son's walking. since he was leaning his weight forward in the walker he wanted to do the same on his feet. he did love it though. he actually loved his jumperoo more though. (by fisher price) it's like an excersacer on bungee cords. it was perfect for when i neeeded to get things done! Ok. I don't have kids, but I have lots of friends who do. Britax is a good brand, but there is a difference in Britax USA and Britax Europe. Europe has much higher safety standards and the Britax seats that are sold in the USA don't meet Europes stringent standards. Don't waste your money on a Britax USA seat. You can't buy the European made Britax seats in the States. Buy a Recaro car seat. They are about the same price as a Britax, but they meet the stringent European standards. Google "Recaro" and it will lead you to places that sell the car seats. I actually have the one you pictured! My little girl is only a few days older than Harper. We bought it when she was about 6 months old. She absolutely LOVES it and has since we bought it. I would absolutely recommend getting one. However the one pictured is a little pricey for the time Harper will probably use one. I would recommend maybe getting a less expensive one and maybe another toy. Maybe one of the sit-to-stand things that they can play with while sitting then can be changed and she can walk behind it! I just ordered a V-Tech one from Walmart yesterday. Get the walker Kelly, as you can see on my blog, Aidan loves it. He has even got to where he can back it up now and give it another try when he wants something, like to try to go up the stairs. Makes him so mad that he cannot get that walker up the stairs, and we NEVER take it up stairs and put him in it. Too dangerous. Worth every penny. Just get 1 from Wal-Mart, nothing fancy, just simple. You might find lots of people and pediaticians that will say walkers are bad and shouldn't be used. However, if you have them in a safe area and you watch your child they are perfectly fine. We had one and loved it. We have tons of pictures and video of Morgan playing in it. We used it long before she could walk, probably around 4 months old until she was about 12 months old. I got her a mixing bowl with a handle and some wooden spoons and measuring cups and she would "cook" in her walker while I was making dinner. She loved it! We could have used it longer but she would dive bomb right in to your ankles so we stopped! We never had a walker. Just a exersaucer and doorway jumper. The jumper was awesome!! She loved it for several months (didn't walk til 13.5 months). We also have a small-ish house so I didn't have room for another gadget. We have a Britax Marathon carseat in the Cowmooflage print. We switched to it the day she turned a year (July) and it's been great! I've had a few friends regret not getting a Britax (went with something cheaper...they are so worth it!). i LOVED the britax carseats!! very much reccommend them. I don't reccommend a walker. my sil used one, and before we had kids, brought hers to our house (we had hardwoods) and I saw my newphew bump into things, and get into drawers etc...it was just too easy for him to get into stuff. We did use a jumper- the girls LOVED it, but once again, they were "stuck" in one spot. As a pediatric physical therapist assistant, I generally recommend against baby walkers because they can develop inappropriate gait patterns and it doesn't put them in the best alignment for walking, which can lead to hip and trunk development issues. For example, I worked with one boy who used a walker that had a stationary toy base in the middle and the walker went around it. When he first started walking, he could only walk sideways and in circles around things! But those precautions are usually just for babies who aren't already developing normally or whose parents leave them in too long. Harper seems to be doing just fine, so I'm sure it would be okay to get her one if you only use for about 20-30 minutes a day. But, like you said, it may not be worth it if she's close to walking on her own anyway. I prefer to see babies crawling around as much as possible because of the strengthening it provides and the fact that it helps to develop a good spinal curve. But I also understand needing to keep her contained sometimes! So go ahead and get one if you really think you'll use it, but make sure she's able to hold her trunk up on her own and stands without using it for too much support and then also limit the time she spends in it! I'm a speech language pathologist and all of the pediatric physical therapists I have ever worked with have said that walkers are a waste of money and dangerous. Many parents think walkers will help their children learn to walk. But they don't. In fact, walkers can actually delay when a child starts to walk. Roll down the stairs — which often causes broken bones and severe head injuries. This is how most children get hurt in baby walkers. Get burned — a child can reach higher in a walker. It is now easier for a child to pull a tablecloth off a table and spill hot coffee, grab pot handles off the stove, and reach radiators, fireplaces, or space heaters. Drown — a child can fall into a pool or bathtub while in a walker. Be poisoned — reaching high objects is easier in a walker. Most walker injuries happen while adults are watching. Parents or caregivers simply cannot respond quickly enough. A child in a walker can move more than 3 feet in 1 second! That is why walkers are never safe to use, even with an adult close by. Throw out your baby walkers! Also, be sure that there are no walkers wherever your child is being cared for, such as child care centers or in someone else's home. Try something just as enjoyable but safer, like Stationary activity centers—they look like walkers but have no wheels. They usually have seats that rotate, tip, and bounce. Play yards or playpens—these are great safety zones for children as they learn to sit, crawl, or walk. High chairs—older children often enjoy sitting up in a high chair and playing with toys on the tray. New safety standards for baby walkers have been in place since 1997. They are now made wider so they cannot fit through most doors, or they have brakes to stop them at the edge of a step. However, these improvements will not prevent all injuries from walkers. They still have wheels, so children can still move fast and reach higher. The American Academy of Pediatrics has called for a ban on the manufacture and sale of baby walkers with wheels. We got a walker and my little boy never cared for it. He could only figure out how to go backwards in it which was obviously pretty frustrating :). Lots of things you read say they slow down their walking progress (why make them then, right?). Others say they are unsafe because they can turn over. I think they'd take them off the shelves if they were too bad. My doctor always told me that it wasn't good for their legs. He didn't even want the kids to be in the exersaucer for more than 30 minutes at a time. I guess it's something about not being the right kind of weight bearing exercise for their legs. Plus there are dangers with walkers if you have any stairs that can't be or people forget to block them. I know my husband fell down the stairs twice when he was a baby in his walker. So we never got one. I do love the Jumperoo things that can be freestanding or attached to the doorway. I used to put the kids in those when I was making dinner since the only doorway with a frame was in the kitchen. My daughter Meredith got a walker as a gift and she really didn't like it. They may be great for some babies (although I have also heard they could delay walking and be dangerous), but Meredith was not really amused with hers! She'd sit in it, and occasionally scoot backwards, but that's it. We only put her in it a few times. She would've much rather have been in her jumperoo or even in her pack n play with some toys! She started walking right before her first birthday. We got her a Britax Boulevard car seat and I LOVE IT! She LOVES it. I just can't say enough good things about it! It allows them to be rear-facing for a long time and that's so much safer than forward facing for toddlers! Mere is so comfy in hers! It's a little pricey but was ABSOLUTELY worth the money!